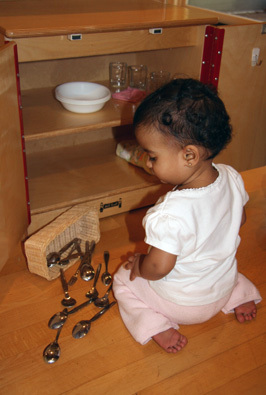 I have been getting my toddler involved in helping to prepare the lunch every day. Most of the time he really enjoys it but sometimes he gets frustrated because things are going wrong for him. I know he will learn from the things that go wrong for him but I am not sure when I should insist that he has started so he must finish and when I should just take over and do it for him. 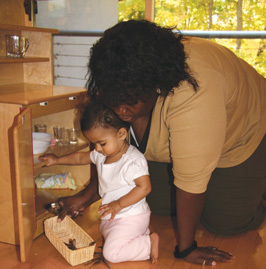 First of all it is important to remember that your toddler is going through a process of development. Some days he will be good at doing things, confident and full of energy to persevere and keep trying and other days he may feel tired and become overwhelmed when things don't go the way he wants them to go. It is important that you get into the habit of recognising his emotional state on any one day and adjust your expectations accordingly. Having said that, as a rule of thumb you should always be thinking about letting him do what he can do and helping him with the parts that he is finding challenging. Perhaps one day he has put butter on his bread for a sandwich, spread both sides with jam and put them together but is having trouble using the knife to cut it into quarters. Don't just finish it off for him straight away. Pick up the knife and show him carefully and deliberately how to cut the sandwich in half. This means that half the difficult part has been done for him and you have given him a demonstration of how to cut the two halves in half again. Offer him the opportunity to do this. He may feel encouraged to try but if he does not just do it for him. Every time you do it you are giving him a demonstration for him to try on another occasion.